My post before HIMSS talked about how jazzed (not jaded) I was to be attending my 20th HIMSS conference. 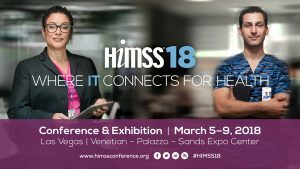 Now that HIMSS18 is in the bag – what did I learn? On Monday I presented the results of our AI survey at the Machine Learning & AI for Healthcare preconference event at the Wynn. Although there were a few hundred seats, the event sold out weeks in advance. A number of folks I knew who planned to buy a ticket at the door were shut out. So that’s a lesson – when it comes to attending hot topics, don’t procrastinate! Kaiser Permanente: Colorectal cancer detection 1-2 years earlier with AI. UPMC: Game-changing pediatric readmissions prediction. Duke Institute for Health Innovation: Implementation of AI with thousands of input features. Stanford Health Care: Working with “small” vs “big” data. Brigham & Women’s: Costs of short-time cancellations vs no-shows. It’s become a given that these leaders and their vendors use AI and use it well. My favorite from the above examples was Srinivasan Suresh, CMIO at Children’s Hospital of Pittsburgh of UPMC. His slide highlighted that, although he had no impressive AI or ML credentials, he was still able to use these kinds of tools successfully to predict pediatric readmissions due to seizures, asthma, and pneumonia, which led to more effective interventions. HIMSS and health IT may be more of a cacophony than a symphony, but I’m glad to be in the orchestra. AI and the cloud were key themes this year and have become mainstream topics. For our views on Eric Schmidt’s keynote about data, analytics, and AI, see our earlier HIMSS18 recap blog. Glad I had teammates that made it into Seema Verma’s CMS keynote the next day – her announcement about patient data access, open APIs, and Blue Button 2.0 was welcome. You may recall the previous year, given the change of administration, there was little that CMS or ONC could say about anything. Although we’re seeing some progress, it doesn’t seem substantial enough to move the needle on value-based care. A big part of my week was meeting with NLP vendors. Chilmark Research is close to releasing our major report on this topic, and it was great to get insights from more than a dozen vendors. Some of the smaller ones are highly focused on specific use cases (Health Fidelity and Talix on risk stratification; Clinithink on matching patients to clinical trials). 3M and its partnership with Alphabet’s Verily are a powerful combination on determining the “dominoes” of costs and care. Also of note: M*Modal’s virtual provider assistant and use of ambient devices, as well as Nuance’s partnership with Epic to add more conversational AI functionality. We are seeing voice assistant success paving the way to virtual scribes – those that can “whisper” in the physician’s ear will be most valuable to ensure that decision support is not bypassed by passive systems. As John Moore posted in his earlier HIMSS18 recap, it’s sad (well, infuriating) that we still have to address interoperability. I attended two events held by the Strategic Health Information Exchange Collaborative (SHIEC), which has been successful in providing a rallying point for 60 HIEs and 40 vendors to share knowledge and provide comments to ONC regarding TEFCA and data exchange. But it only represents a fraction of the hundreds of private and public HIEs in the country, so there is still a long road ahead. A payer committee was a welcome sign that convergence was part of their agenda. At the opposite end of the interoperability spectrum, I attended a session by Houston Methodist on body sensors, where the distances are measured in inches and the signals are often so weak that temperature or motion (such as a kicking baby) are enough to throw them off. Sensor network fusion is the frontier – the more information you can capture from more places with more context, the better. For example, one of Methodist’s use cases was rapidly predicting a patient fall. I also met with Somatix, a small vendor with a big idea we’ve been hearing about for years – using data from wearables to track more routine activities of daily living (some of which, like smoking, are harmful). The vendor is attempting to take this to the next level with more accurate gesture detection and predictive analytics so appropriate (and even real-time) interventions can be made using specific apps. 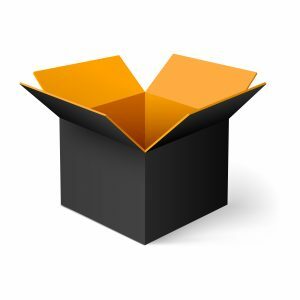 As Brian Eastwood recently posted, we’re still waiting for wearables to provide insight. I didn’t sport a wearable at HIMSS18 (I broke two and lost another in 2017), but I’m on the lookout for a good, waterproof one. Another key area of focus for us is the use of AI to interpret digital medical images. An impressive talk by University of Virginia and the National Institute of Health included use of speech recognition (using Carestream and Epic) to embed hyperlinks of AI-recognized areas of interest into reports for the EHR. The two-year effort showed productivity improvements of 3x over unassisted analysis and reporting. A presentation by Entlitic claimed AI-enabled “superhuman” techniques able to detect lung cancer two years sooner than existing approaches. Their solution made it easy to compare an existing case to similar cases where timelines of data showed disease progressions. The company has 65 radiologists that label their training data, claiming only 1 in 4 that apply for the job pass their test. We’ll dive into detail about these kinds of advances in our Digital Medical Imaging Report scheduled for Q4’18. I spent time with Ambra, a major provider of image exchange solutions (others include Nuance and lifeIMAGE). Aside from the challenge of the size of medical images, it always surprises me how difficult it is to move them around and make them available despite good standards (DICOM). It was only recently that Epic, for example, addressed image exchange, and it’s not part of many HIEs. I’m glad to see we’re moving beyond the vendor neural archiving discussion and toward a focus on the cloud and useful exchange of images in clinician workflow. I also attended half a dozen receptions during the week. The biggest was sponsored by a large consulting firm. It was an evening of fun, but it reminded me of what was right and wrong about our industry and a conference in Las Vegas – who’s really paying that bill? My last reception was with BetterDoctor, which specializes in the quality of provider directory data. It always seemed ironic to me that the most regulated profession in the world has such a problem with accurate information (retirement, credentialing, locations, and so on). 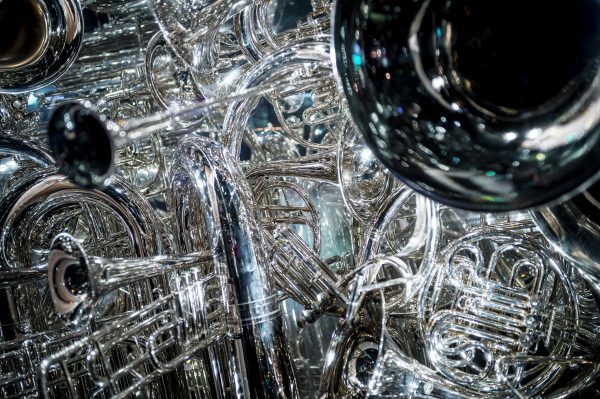 To rework my “I’m Jazzed” comment from the top with a music metaphor, HIMSS is more like a blaring of thousands of different instruments with each of the “sections” competing to be louder than the other – and the sounds of Vegas don’t help. There are many great musicians and an increasing number of duets (e.g., partnerships, ACOs), but we’re still playing off too many different pages. Adding to the problem is the conductor (the government) changing every few years. It may be more of a cacophony than a symphony, but I’m glad to be in the orchestra. I hope you are, too. A decade of attending the annual HIMSS conference and I leave both excited and depressed. Excited and enthused by meeting so many people who are dedicating their lives to affect positive change by improving healthcare delivery through IT. Depressed as yet again I find a lack of real leadership and vision among many who repeat the years’ worn phrases of interoperability, patient-centered care, reducing physician burden, and the like. “Oh please, can’t we just get on with it,” I scream to myself. 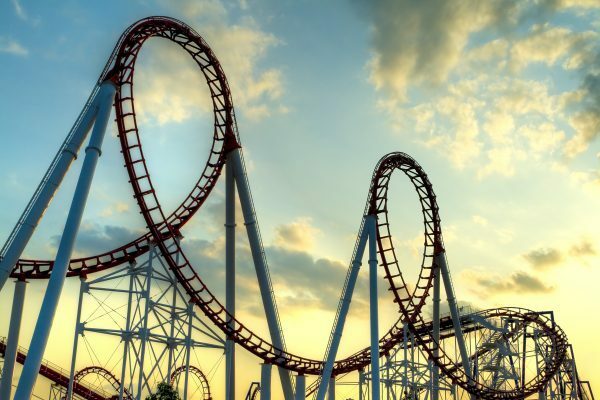 In keeping with the bipolar theme that is HIMSS, following are my takeaways, in an up-down fashion. Up: Anthem goes public on its deal with Epic r/e HealthyPlanet. This partnership is an exciting step in enabling provider-payer convergence wherein Anthem will embed IP (risk, prior authorization, claims adjudication, etc.) into HealthyPlanet and take HealthyPlanet to market with wrap-around services. Down: Head-in-the-sand vendors who are entrenched in FFS model. These vendors told me point blank that the market will revert back to FFS, that value based care is DOA. Gotta wonder what they’re smoking. Up: Telehealth going mainstream. Saw loads of examples/demos of telehealth with direct or near-direct integration to the EHR. Been hearing about the coming of telehealth since I started this company in 2007. I believe we are finally there. Down: Almost zero discussions on managing the costs of care/cost containment. There was some discussion on reducing clinical variability – but beyond that, HIMSS was devoid of any deep conversations on this critical variable in the value equation. Up: Clear demonstrable, scalable use cases for AI. I was particularly impressed with the work 3M has done with Verily, leveraging Deep Mind technology for specific measures. Though just released, 3M has already landed 17 provider clients and 2 payers. Down: The preponderance of AI vendors with little sense of scaling their solution. Many of the AI vendors I talked to have ongoing projects with “Big Brand” healthcare systems. That’s great – but disturbingly, few have taken the next step to address how they plan to scale their solution within an organization for widespread adoption and use. Up: New solutions leveraging FHIR to insert actionable insights directly into clinical workflows. This is near nirvana for me, as it gets beyond the Herculean task of interoperability writ-large and tackles those points where significant friction and opportunity exists. Down: One policy pundit after another talks yet again about the need for interoperability. Frankly, this is no longer a technical issue. Interoperability is a policy issue and really does not belong at an event such as HIMSS – where we should be talking about the future, not rehashing the past ad nauseum. Clearly, a lot of work lays ahead for us in the health IT arena, which provides us all meaningful work going forward. And frankly, we are in but the top of the third inning – there is so much to do, it really is an amazing time to be in the healthcare IT market. Thankfully, we are at last moving beyond the prescriptive use of IT via meaningful use, transitioning to meaningful insights from the data we are collecting and placing into clinical workflows. There is a near unfathomable opportunity to begin leveraging clinical, genomic, and other data sets that will lead us to dramatic improvements in care delivery – improvements that are likely beyond our comprehension at this time. Despite some of my downer moments at HIMSS18, I could not be more excited for what the future holds for us as an industry – and, personally, in how even I and my care team will leverage new insights to more effectively and efficiently manage my own condition. Having returned and (mostly) recovered from HIMSS18 in Las Vegas, the Chilmark Research team wanted to share our thoughts on what we saw in presentations and heard in conversations. This post includes our analysis and insights on Care Management and Engagement; additional posts will consider Analytics/AI and Interoperability as well as Population Health Management and Convergence. Overall, we were pleased to see progress on telehealth, as well as a broader understanding that healthcare organizations (HCOs) will get patient engagement right only when they assemble a comprehensive collaborative health record (CHR). On the other hand, we were disappointed in slow progress toward addressing two prominent public health issues — the opioid crisis and behavioral health — as we didn’t see many large-scale use cases for engagement in general or episodic payments in particular. There certainly was an increased awareness and discussion of integrating behavioral health into primary care and care coordination at HIMSS18. However, this shift is still in its very early stages. Lack of focus on the opioid crisis: Last week, the CDC released a Vital Signs report that showed a 30% increase in emergency department visits due to suspected opioid overdoses from July 2016 to September 2017. Despite this continued public health crisis, there was a general lack of targeted solutions or marketing focused on this topic at HIMSS18. Instead of vendors helping providers to help address this problem at the point of care or service, though, there is a “top-down” approach at the state level emphasizing tighter prescription regulations, inventory control, and tracking. There were some specific examples we did find though. One vendor, Venebio, has created a predictive analytics solution to identify and predict the specific overdose risk over the next 12 months for a particular patient; Venebio is selling to state Medicaid agencies, payers, and providers. Collective Medical, through their EDIE report, is helping to provide a list of current medications for ER patients which facilitates identifying drug-seeking patients. Integrating behavioral health is in its early stages. There certainly was an increased awareness and discussion of integrating behavioral health into primary care and care coordination, including several educational sessions on the topic. However, this shift is still in its very early stages. To be determined: What types of models by the work best in varied primary care settings; how IT solutions such as telemedicine and digital health might help to address various challenges, including a lack of sufficient behavioral health providers and lengthy behavioral health service queues; and the role of self-support tools, which have high levels of engagement and effectiveness. Scaling episodic payments remains a huge challenge. While a number of HCOs have already engaged in an episodic payment for a particular procedure or two in a service line (such as cardiology or orthopedics), scaling these efforts across several service lines for an HCO remains a challenge as solutions remain immature and most HCOs are in the early stages of forming post-acute networks. Some of the biggest challenges include the timely notification of when a patient enters into an episode, an inability to track patients across and outside the HCO, and an effective patient engagement strategy that is customizable to meets the needs of a patient in a particular episode. Data matters. If there was a unifying theme to the preconference Patient Engagement & Experience Summit, it was the need to begin patient engagement efforts with a CHR – one combining clinical, claims, consumer, financial, and patient-generated health data to provide a comprehensive view of a patient’s diagnoses, social determinants of health (SDoH), and barriers to receiving care. Record in hand, healthcare organizations (HCOs) can shift away from generic patient outreach – think portal message, email, or even snail mail flier – toward outreach that better meets patients’ individualized needs. If there’s a theme to my patient engagement conversations so far at #HIMSS18, it’s a clear shift to more personalized and targeted outreach. Use cases remain simple. The operative word above is can, as HCOs aren’t yet meeting individualized needs. Many use cases at the preconference summit highlighted a single condition: Asthma, colon cancer, sepsis, substance abuse, outpatient physical therapy, etc. Two factors seem to cause this. The first reflects the adage that you can’t manage or improve what you cannot measure. Since HCOs are measuring readmission rates, HCAPHS scores, and joint replacement bundled payment performance as if their financial lives depended on it (and they do), patient engagement and experience efforts are frequently tied to these metrics. Do something for a year. Telehealth is maturing. If there was a bright spot for the engagement domain at HIMSS, it was the level of activity in the telehealth market. (Full disclosure: I wrote my first “telehealth is ready to take off” article in 2013.) Nathaniel Lacktman, chair of the law firm Foley & Lardner’s telehealth industry team, pointed out that the recently passed federal budget includes several extensions of telehealth reimbursement under Medicare, particularly for kidney dialysis, telestroke, and the patient-centered medical home. This should provide HCOs with the impetus to initiate or expand telehealth efforts that have otherwise stalled. Plus, as John Moore pointed out in his HIMSS18 recap, telehealth vendors are pushing to cover the vast area between low-acuity DTC services and inpatient services through a variety of strategies. These include offering chronic condition management, supporting outpatient care settings, or unifying their inpatient and at-home UX. Stay tuned for Chilmark’s forthcoming report, Telehealth Beyond the Hospital, which will examine these strategies in much greater detail and identify which vendors are best positioned to execute in this market.